A small rounded tree, named after a town in Minnesota. 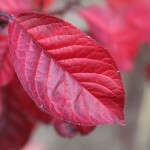 The leaves emerge bronze-purple, stay dark purple in the summer, then change to red in the fall. The flowers are single light pink and fragrant in the early spring. 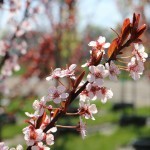 It will rarely set small plum fruits. It performs well in tough climates. It grows best in full sun to part shade, in average, medium moisture, well-drained soils. The best flowering and purple leaf color is in full sun.